School holidays and Mother’s Guilt go hand in hand in my book. You see, I’m a working Mum so although I look forward to the school holidays as much as anyone, I always end up with The Guilts about school holiday programmes. I’ve always worked and am lucky that I enjoy working, and I strongly believe it is a personal choice to either go out to work or be a stay-at-home mum, finances permitting of course, but I can’t help envying those mums who don’t have to work and therefore don’t have to worry about packing little ones off to be looked after by strangers when I’d far rather spend the holidays with my family. I have friends on both sides of the spectrum – some work full-time, some part-time and others don’t work at all (and by that I mean aren’t in paid employment for a certain number of hours per day as I in no way want to imply here that they aren’t working by staying at home – eeek!). Hats off to them for being full-time stay-at-home mums as that has it’s own set of challenges I’m sure. Over the past few years, however, I have noticed that it is the working Mothers who are happy to swap days and look after each other’s children to try to ease the load while some stay-at-home Mums are concerned that they may be taken advantage of by people who choose to work so should pay for holiday care. And they could be right, if it happened regularly, but I think the occasional playdate or offer to help from friends shouldn’t be an issue as its not about the money, well, not all of it anyway as these programmes are expensive, it’s just nice for the kids to see their friends and for working mums to know and trust the people you’re leaving your offspring with. But I have to wonder how I’d feel if the shoe was on the other foot…who knows, easy to say that I wouldn’t mind, but perhaps I would. Thankfully I am blessed to have a part-time job (school hours only) so I still get to do the twice daily school runs as well as any sporting extracurricular activities during the week. Balancing work and Motherhood can be tricky while still trying to manage a home and feed your family healthy wholesome meals. We’ve just come to the end of the first week of the winter two week break and as it’s soccer season, I signed my little man up for the soccer holiday programme. Last Sunday arrived and so did the worst weather we’ve had in weeks – not one of my best ideas. Bad Mother! Poor boy was drenched to the bone and looked like an advert for washing powder by the time I collected him on the first day. The next few days proceeded to lash our beautiful north island with wind gusts of 100km/hr (worse in some areas), floods, power outages, etcetera etcetera etcetera. My boy stoically went to soccer each day and ended up having fun I’m sure, but I couldn’t escape my feeling that I was subjecting him to all manner of unfair treatments that I didn’t have to endure and certainly wouldn’t do personally if I had the choice. The nice thing about coming home early though is that I have the time to cook healthy hearty meals for my family without too much fuss. One of our favourites is Beef Lasagne and now I have to admit that I don’t make my own lasagne sheets as I haven’t yet acquired a pasta machine – it’s still on my appliance bucket list. 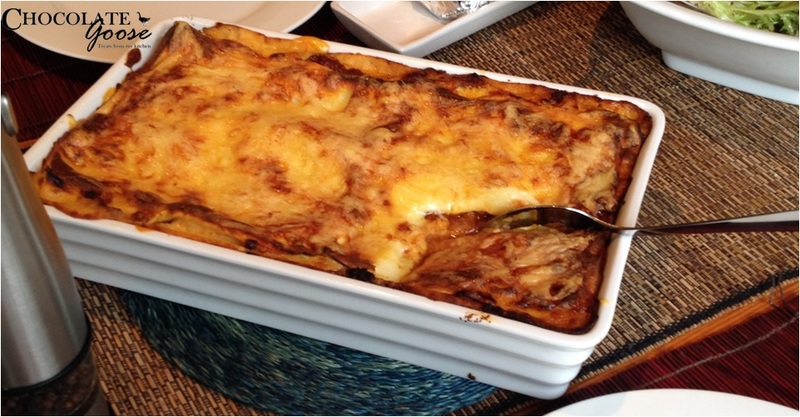 But fresh lasagne sheets work very well, they cook quickly and taste delicious. You also won’t find a bottle of tomato passata in sight, but of course, each to their own and all that, but it honestly doesn’t take much longer cooking from scratch when you weigh up the pro’s and con’s of monitoring what you’re feeding your family. I make a basic Bolognese sauce which is also fantastic with spaghetti – another firm favourite in our home. I think if I served it 5 nights a week my family would be happy. Thankfully they enjoy veggies so I don’t have to mess about trying to hide them in our food, but for those families who do, this is a great way of adding a few hidden ones to the mix and no-one will be any the wiser. Simply grate and add carrots, courgettes, peppers, swedes, leeks or parsnips (I used to call these white carrots when questions were asked); but served with a side salad, I just stick with the simple sauce below. Fry the chopped onion and garlic over a low heat until onion is soft and translucent. Add the mince, breaking up into small clumps so it cooks evenly. When the mince has all changed colour, add the herbs, the tin/chopped fresh tomatoes and tomato paste. Cook for about 5 minutes, stirring occasionally. Add the hot water, sugar, chutney and Worcestershire sauce (or brandy) and bring to the boil. Turn the heat down and simmer, stirring occasionally for at least a half hour, preferably an hour (longer if possible) to allow the flavours to develop. Season with salt and pepper and add the chopped/torn basil leaves. Yes, I do a plain cheese sauce but you can go the whole hog with the traditional Bechamel sauce if you want to. Regarding the measurements – I use a table spoons of this and a dash of that until I get the texture I want but use the measurements below if you aren’t used to making a cheese sauce. Melt the butter in a saucepan over a low heat. Don’t let it boil and split. Remove the butter from the stove and add the flour, stir to combine and ensure there are no lumps. Return the pan to the stove and gently heat the flour butter mixture, stirring continuously. You want to cook the flour a little before adding the milk. Slowly add the milk, a little at a time, stirring constantly (I find stirring with a small whisk works well). Continue to add the milk and stir until you have a thin lump-free white sauce. Bring to the boil, stirring constantly so the flour doesn’t settle on the bottom, and when thickened, reduce the heat and allow to simmer for about 5 minutes. Grate half the parmesan into the sauce and stir. Season with a little pepper if need be, the parmesan should offer sufficient saltiness. Spoon a little of the cheese sauce onto the base of the dish and spread it around to cover the bottom. Lay out the first layer of lasagne sheets, trimming where necessary so it doesn’t overlap but covers the full area. Cover with a layer of the mince sauce. Spread over a layer of the cheese sauce. Repeat steps 2 – 4 until you’ve used all the ingredients, ending with a layer of cheese sauce. Grate the remaining parmesan cheese and sprinkle over the top. Bake in the preheated oven for about 30 – 40 minutes until evenly browned on top and you can see it bubbling enticingly. Serve with a side salad and garlic bread.